Looking for some high tech spooky family fun? 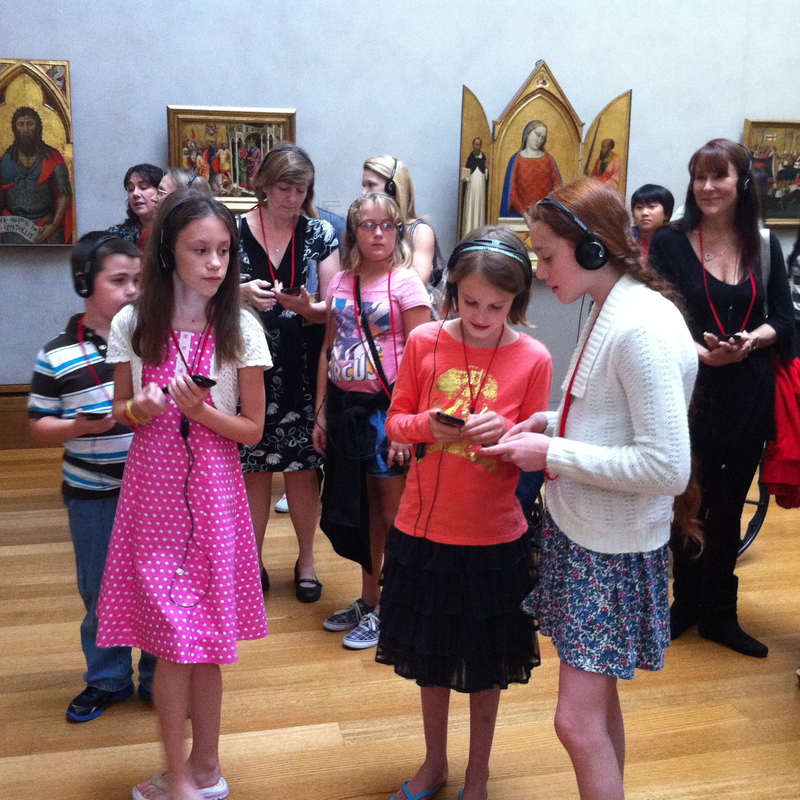 Check out the new iPod Touch kids audio tour at the Getty Center Museum. My family and I got a sneak peek of the audio tour Demons, Angels, and Monsters: The Supernatural in Art the day before its release in October 2011. On this special inaugural tour, we joined kids who worked on the project, and their families, as they heard themselves for the first time on the finished audio tour. That’s right, this audio tour was created by kids, for kids. You won’t hear art historians and curators narrating this tour. Instead, you’ll hear children sharing their unique impressions of the Museum’s art collection. Even better, the children are everyday kids like yours and mine – not paid actors. The Museum found most of the kids (ranging in age from 9-15 years) by putting out a request on Twitter and Facebook. My techno savvy sons connected instantly with the tour’s iPod Touch format — they hooked up their iPods with lightening speed and couldn’t wait to get started. The tour highlights supernatural beings and tales found in the Museum’s paintings, sculptures, and stained glass pieces. Each audio stop includes a lively mix of the children’s narrations, sound effects, and the cartoon-like voices of the otherworldly characters portrayed in the art like superhero angels and troublemaking demons. The characters are very entertaining, but I think the children’s narrations steal the show. My 9 yr old son enjoyed hearing the kids use words like “sassy” to describe defiant angles, and not “old school” to describe their robes. This contemporary language helps kids relate the art to their everyday lives, and that’s not an easy thing do to when we’re talking about art dating back to the Middle Ages. Anne Martens, of the Getty Museum’s Collection Information and Access department, felt it was important to let kids create the content because only they know what it’s really like to be a kid. Martens said, “I knew that what they’d create would be authentic and engaging.” And she was right. The children’s comments are not only engaging; they’re also quite astute and deeply moving at times. One audio stop focuses on a sculpture of Hercules slaying a dragon. My 7 yr old son thought the dragon, with his silly voice and dialog, was the funniest character. But when the child discussing the sculpture said he felt sad for the slain dragon, I honestly did too. There was just something about the way he said it that cut right to the raw emotion of the piece. 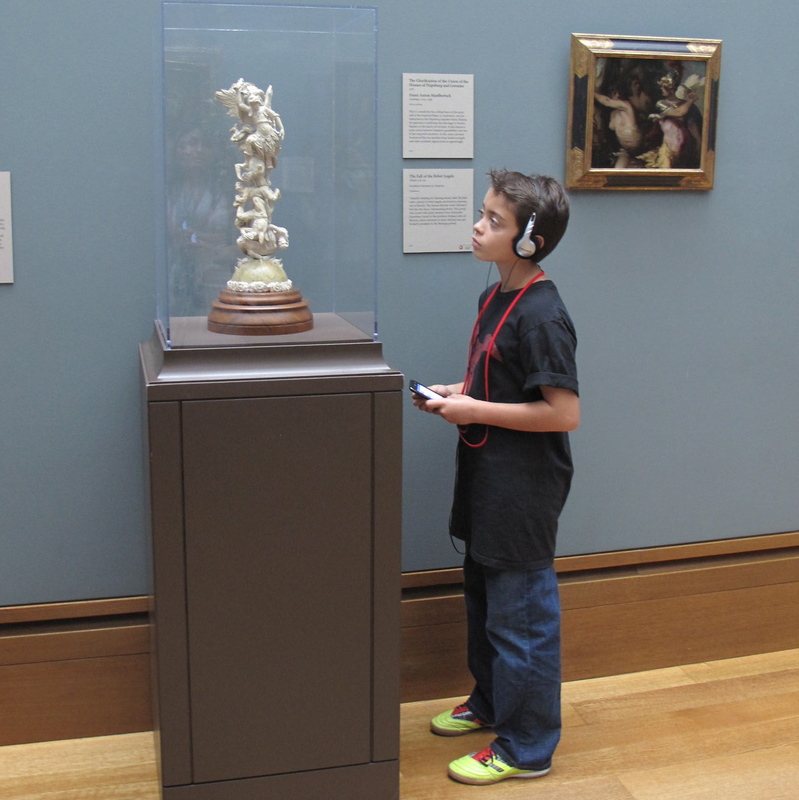 We could see that the children who made the audio tour learned a lot about the Getty’s art collection. And according to Anne Martens, she learned a lot from the kids as well. After working with them she said, “I saw a lot in the art that I never saw before.” Take this audio tour and I think your family will see the Getty Museum’s art collection in a new way too, and have a lot of fun in the process. Art Image: Polyptych with Coronation of the Virgin and Saints (detail), about 1390s. Cenni di Francesco di Ser Cenni (Italian [Florentine], active 1369/1370–1415). The J. Paul Getty Museum, Los Angeles.